How do I install Draftsight CAD? I've installed the 11.04 64bit version and now i can't install Draftsight (32bit with force architecture option) because there is an error with the library libexpat1.. anyone know how solve? Editor's note: the error messages have been translated and don't match the real ones exactly. Obviously you should run this command while inside the folder where you have saved Draftsight.deb. You probably did not install the missing library. On 64bit Kubuntu 12.04 there is a libgtk-x11 error. then a menu should have been created in the graphical ubuntu menu : you can launch it"
I hope you serve like me. just extract .deb file and run it as a root and it will work. 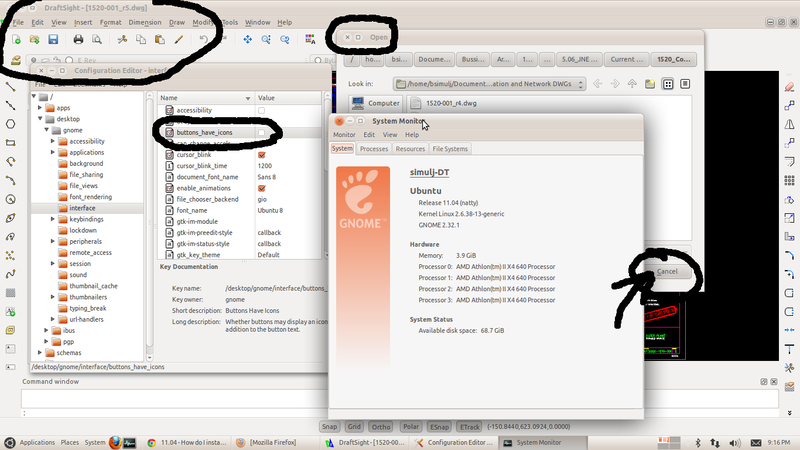 I have succeeded in to install draftSight in Ubuntu 12.04 (beta2) 64 bit. I just have installed the required libraries and then extracted the .deb file content. After that i just have created a launcher in the desktop..
libexpat1:i386 is unpacked, but has never been configured. I have tried installing this libexpat library through getlibs but nothing seems to let DraftSight install correctly. Above solutions does not worked in fresh install of natty narwhale 11.04 64 bit. System crashed after attempts: dpkg with force & make deb file for all architectures & trying alien rpm to deb & (re)installation and configuration libraries for i386 (supposed it destroyed system). I rescue system with reinstallation and configuration libraries for amd64 & update and upgrade system. Ubuntu 11.04 Natty and DraftSight works. You can try install libc6 for i386 (simultaneously to already installed libc6 for amd64) from synaptic. I guess it helps in my case. I finally got it to work under Ubuntu 11.04 64 bit. Believe me or not after I installed it I had to delete configuration files in home directory which are starting with "." or move them to some folder if you have wine app or something like that. For people which doesn't like this idea, to delete configuration files, try to create another user account and run it from there. In ubuntu 12.04, consider modifying the control file of the deb package to remove dependence problem. The systems seems to keep track of the problem and de-installing the application, next time synaptic/dpkg is recalled. "I found that it is possibly to run this software by running it as a root (sudo) but still not functional trough normal launcher. Ubuntu 11.04 start command is:"
Jorge Castro: I faced the same problem after installing DraftSight. I solved it by running DEBIAN/preinst script 'as normal user', it then asks for administrator password, then the licence agreement gui shows up(accept it). Keep doing it until it says "access control disabled, clients can connect from any host" in the terminal, run postinst script after that. You may want to delete any '.draftsight' dir in your home directory PRIOR to running the scripts in DEBIAN folder. Move your DraftSight.deb file to your home folder /home/yourusernamehere. You'll have to download files while updating. about 200MB, depends on your situation. I followed the below steps and it worked for me (this is after I had downloaded the dependencies as described above). Not the answer you're looking for? Browse other questions tagged 64-bit dependencies cad or ask your own question. How to lock my screen? How can I resolve dpkg error?